The US, EU and other democracies are accepting flawed and unfair elections out of political expediency, Human Rights Watch says in its annual report. Allowing autocrats to pose as democrats without demanding they uphold civil and political rights risked undermining human rights worldwide, it warned. HRW said Pakistan, Thailand, Bahrain, Jordan, Nigeria, Kenya and Russia had been falsely claiming to be democratic. The World Report 2008 summarises human rights issues in more than 75 nations. In the report, HRW said established democracies such as the US and members of the European Union were increasingly tolerating autocrats "claiming the mantle of democracy". "In 2007 too many governments, including Bahrain, Jordan, Nigeria, Russia and Thailand, acted as if simply holding a vote is enough to prove a nation 'democratic', and Washington, Brussels and European capitals played along," it said. "The Bush administration has spoken of its commitment to democracy abroad but often kept silent about the need for all governments to respect human rights." HRW Executive Director Kenneth Roth said it had become too easy for autocrats to get away with mounting a sham democracy "because too many Western governments insist on elections and leave it at that". "They don't press governments on the key human rights issues that make democracy function - a free press, peaceful assembly, and a functioning civil society that can really challenge power," he added. HRW said the West was often unwilling to criticise the autocrats for fear of losing access to resources or commercial opportunities, or because of the perceived requirements of fighting terrorism. "It seems Washington and European governments will accept even the most dubious election so long as the 'victor' is a strategic or commercial ally," Mr Roth said. HRW highlighted Pakistan as an example. It said the US and UK, its largest aid donors, had refused to distance themselves from President Pervez Musharraf, despite his "tilting the electoral playing field" by rewriting the constitution and firing the independent judiciary ahead of February's election. 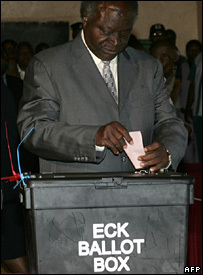 It also argued that Washington's acceptance of the result of the Nigerian election in February 2007, "despite widespread and credible accusations of poll-rigging and electoral violence", had encouraged the Kenyan government to believe that fraud would be tolerated in December's presidential poll. And it said the US and some allies like Britain and France had made it harder to demand other countries uphold human rights by committing abuses themselves in the "war on terror". The German Chancellor Angela Merkel, French President Nicolas Sarkozy and other European leaders were criticised for their reluctance to allow Turkey to join the EU, despite its improved human rights record. HRW said the EU "lost leverage itself and diminished the clout of those in Turkey who have cited the prospect of EU membership as a reason for reform". Among the countries where the watchdog said human rights atrocities had been committed were Chad, Colombia, the Democratic Republic of Congo, Ethiopia, Iraq, Somalia, Sri Lanka and Sudan. Burma, China, Cuba, Eritrea, Iran, Libya, North Korea, Saudi Arabia and Vietnam were criticised for severe repression and closed societies. When asked about the claims made by HRW, US state department spokesman Sean McCormack said he had not seen the report, but insisted his country did not promote false democracy and condone human rights abuses. "In terms of the United States and this administration speaking up in defence of, and advocating for, and putting its effort behind its rhetoric, I don't think there's any question about where we stand in terms of promotion of democracy," he told reporters.